The very concept of a sprawling novel can be daunting for both the reader and the author. A writer has to be able to juggle narratives like flaming chainsaws dripping with acid. The reader needs to stomach the occasional hundred-page long digression away from characters they’ve grown to love. Any writer who challenges himself to even attempt a book that spans over fifty years of American history is setting himself up for a world of hurt. To pen this as one’s debut novel, well, that’s either swaggering bravado or icy veined self-confidence. Or, perhaps, as with Nathan Hill’s novel, The Nix, a bit of both. At 625 pages, The Nix is a novel reminiscent of the family dramas of Jonathan Franzen and the postmodernist machinations of David Foster Wallace. It is simultaneously a portrait of an estranged mother and son and a critical look at how history and culture shape our lives. The novel opens with a gun-toting, life-sized flag pin of a governor (think Ted Cruz, but with a bigger cowboy hat) having rocks thrown at him by a sixty-something woman outside a rally in Chicago. That woman is Faye Andresen-Anderson, who is as mysterious to the world as she is to her 34 year old son, Samuel, who has not seen her since she abandoned him and his father when he was 11. Samuel, a struggling writer and professor of English at a small university outside of Chicago, is enlisted by Faye’s attorneys to write a letter to the judge on her behalf. Because that is exactly what a man would do for the woman who left him motherless, right? Which is why Samuel has actually hatched a plot with his amoral, Roger Sterling-esque publisher, Guy Periwinkle, to pen a tell-all memoir about his awful, hippie, commie mom, a book which Periwinkle believes will help boost the candidacy of the previously-mentioned odiousness of a governor. And that is basically the 75-page prologue to what could have been a rambling series of detours through several decades of Americana, but instead is an almost perfectly crafted exploration of history and how it shapes individuals. The conceit of the novel has Samuel investigating his mother’s past, a past which she has kept secret from everyone in her life. We know she grew up in Iowa, was a smart, capable, independent young woman in the mid-1960s who dreamed of college when her peers fantasized about having three kids by age twenty-two. We know she went to the University of Illinois-Chicago for a few weeks in 1968. We know she left Chicago and moved back to Iowa to marry her dopey but loyal high school boyfriend, Henry. That they had one son, Samuel, and that she mysteriously left them in 1988. What we don’t know, and what Samuel is trying to get at is why. Hill peels the onion expertly. He dives back for long stretches of time to Faye’s youth in Iowa and Chicago in 1968 during the tumultuous Democratic National Convention. He goes back to Samuel’s youthful relationships with Bishop and Bethany Fall, one his closest ally, the other his first love. He goes back to Iraq War protests in New York during the 2004 Republican National Convention. He goes back to Occupy Wall Street. And he goes to frigid northern Norway from where Faye’s father Frank Andresen had escaped, also under mysterious conditions. It is from Norway and its myths that the title of the novel comes. The Nix is a Norwegian spirit who appeared to children as a friendly horse. They’d ride it and show off to all the other children. The kids who were victims of the Nix always felt, at first, fear. Then luck. Then possession. Then pride. Then terror. They’d kick at the horse to go faster until it was in full gallop, the kids hanging on to its neck. It was the best thing that had ever happened to them. They’d never felt so important, so full of pleasure. And only at this point – at the pinnacle of speed and joy, when they felt most in control of the horse, when they felt the most ownership of it, when they most wanted to be celebrated for it and thus felt the most vanity and arrogance and pride – would the horse veer off the road that left town and gallop toward the cliffs overlooking the sea. The moral of the story Frank tells his daughter Faye is “Don’t trust things that are too good to be true.” When Faye tells this story to Samuel, however, she revises it: “The things you love the most will one day hurt you the worst.” Both statements sound so cynical it’s as if the speakers themselves were willing them to be true. But both firmly believe what they say. Both Frank and Faye carry the baggage of history on their shoulders. Within them is not only their own personal history, but also the history – and mythologies – of their lands. Another bit of Norwegian folklore is the Nisse, a house spirit that once riled up, will follow you your entire life, tormenting you, cursing your every step. The only way to get rid of it is to take it home, wherever that may be. While Faye is an intelligent woman who does not trade in superstition, she firmly believes that a Nisse has been haunting her since she was a girl. This is central to what unites even the most disparate characters in The Nix – the sense that one is trapped in circumstances beyond one’s control. What happens to Faye both in Iowa and in Chicago makes her believe she has somehow sinned and that this sin has trickled down through her entire life, that this is her curse. Similarly, Samuel believes that he has squandered his one chance at love, and that choice has influenced every moment of his life since then. Samuel is a morose, almost depressed individual. And he has every right to be. He spends most of his free time playing a World of Warcraft style game. There he starts up a friendship with Pwnage, a man whose every waking moment is consumed by the game. Samuel is also being threatened by a college Sophomore who he has flunked for plagiarism. Both Pwnage and the student, Laura, get multiple point-of-view chapters. Neither character adds to the narrative in a strict sense, both are tangents that I thought would dovetail back towards the main story, but never quite do. Still, the portraits of both characters – while admittedly over-the-top – are comically sad. Pwnage dreams of eating healthier, winning back his ex-wife, writing his detective novel, and finally giving up his twelve hour days as a make believe elf. But he has become too entrenched in the routine of his own existence, in his case the comfort food of video games. Laura, who unfortunately comes across for the most part as a caricature of upper middle class privilege, is also trapped in the belief – mainly instilled by her mother, but also fostered by the echo chamber of social media – that whatever she does is right. If there is one misstep in the novel, it is Laura, who possesses almost every caricature of the spoiled millennial as seen from the pen of the older, wiser, Gen-Xer. What sets this novel apart from so many others is its accessibility. Yes, it is long, yes there is one breathless chapter-long sentence that in other hands would seem overly indulgent. Yes, the specific details of a massive multi-player role playing game can seem a bit too detailed. And yes, the the narration will drop into the heads of over a dozen different major and minor characters, amongst others, Hubert Humphrey and Walter Cronkite. It’s a complexly written novel, but not a complexly read one. Like the best of John Irving, the author here escorts you on a journey, lets you stray some, but always brings you back to the path once the detour is over. And like the best of Michael Chabon, Hill here fully immerses us in the histories the characters live through. Specifically, the sequence on the Democratic Convention is a long, but breathless read, consisting of multiple points of view over a series of 2-3 page chapters, detailing the chaos as it unfolds and explodes in the streets of Chicago. Generally, writers who write about writers is a recipe for disaster. This conceited idea that the rest of the world is at all interested in the life of a writer is a trap for even the most skilled authors. Here, however, Hill makes the smart decision to have Samuel be not such a good writer after all. He’s published one short story, received a publishing deal, but has yet to fulfill it. Key here is that he hasn’t written in years, and he hasn’t written because he is – like his mother – imprisoned by a past he cannot outrun. To reference another literary cliché, this is his metaphorical impotence. If at this point in this review you are saying to yourself, “This sounds like a downer,” I assure you it is not. 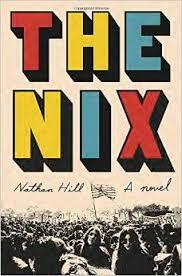 True, The Nix is not some uplifting piece of summer beach read hokum. But it is, at times, hilarious. If Hill views people as prisoners of their times and paralyzed by culture, the skewering of those times and the culture of those times is sharp and incisive. The scene where Faye throws rocks at the governor is seen wholly through the distorted lens of cable news. A logo is made: Terror in Chicago. It whooshes to a spot next to the anchor’s ear and flaps like a flag in the wind. The news displays a map of Grant Park on a massive touch-screen television in what has become a commonplace of modern newscasting: someone on television communicating via another television, standing in front of the television and controlling the screen by pinching it with his hands and zooming in and out in super-high definition. It all looks really cool. If contemporary America fawns slavishly over its status updates and BREAKING NEWS alerts, the era of the 1960s is also similarly satirized, though with a good deal more empathy. We are thrown right into the midst of the anti-war movement, and while the student protestors in 1968 Chicago aren’t addicted to their technology, they are still creatures of their times. To Hill many of the protestors – while righteous and right in their beliefs – have traded their individuality for the homogeny of “the Movement.” In that way they are as caught up in the cult of the self as their children and grandchildren will be decades later with their phones and online games. Yes, the book is sprawling. It’s long, detailed and, most importantly, always involved with the characters. Except for a couple of the minor antagonists, everyone in The Nix is a muddle of good intentions with bad execution. (The minor antagonists, while also given their own chapters, are far more bad intentions with better execution.) The novel is a treat, a delight, a long family saga that breezes by. Funny but never too much at the expense of people we’ve grown to like more and more with each passing page. It is craftily written without being too clever for its own good.